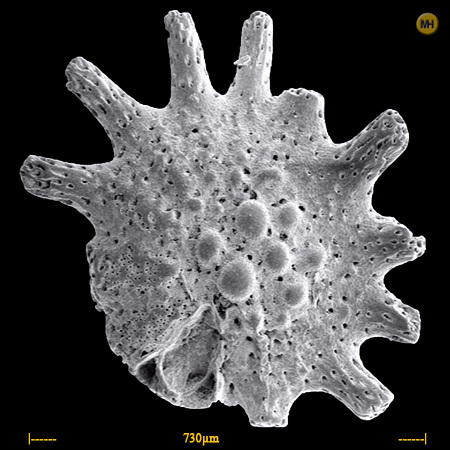 The Calcarinidae are a group of Foraminifera known from the Upper Cretaceous to the present, often with large spinose outgrowths on the test (Loeblich & Tappan 1964b). See also: Star sands (Taxon of the Week: Calcarinidae). Characters (from Loeblich & Tappan 1964b): Test coiled, without differentiation into spiral and umbilical surfaces, advanced genera may become globula, large spines formed by thickenings, not marginal projections of chambers; canal system diffused, confused with perforations. This is an abraded specimen of Calcarina defrancei d'Orbigny. Thanks for the correction, I've updated the caption.